Scientists funded by the UK’s Defence Science and Technology Laboratory have developed a new technique for treating injured limbs, which could significantly reduce the risk of amputation after battlefield injuries. Created in response to the experiences of soldiers in Iraq and Afghanistan, this novel three-stage technology seeks to stop battlefield haemorrhaging, while also preserving as much tissue as possible, hopefully leading to full limb preservation. Elliot Gardner investigates. Despite advances in body armour and medical techniques, the basic method for treating a severely damaged limb on the battlefield hasn’t changed much to reflect the realities of modern warfare. Image: Strathclyde University. "We're all aware of the number of young folks coming back from conflict suffering from limb injuries, often followed by limb loss." Image: Strathclyde University. "It’s a very austere environment, so whatever technologies that we bring to bear have to be suitable for deployment in a very sparse setting." Image: Strathclyde University. There have been more than 1,600 major extremity amputations carried out on US military personnel as a result of the wars in Iraq and Afghanistan. Between 2007 and 2012, 240 British armed forces personnel were given amputations as a result of injuries sustained during battle. It is more than an understatement to say that these injuries, often caused by improvised explosive devices, are life-altering for the servicemen and women who sustain them. Despite advances in body armour and medical techniques, the basic method for treating a severely damaged limb on the battlefield hasn’t changed much to reflect the realities of modern warfare. 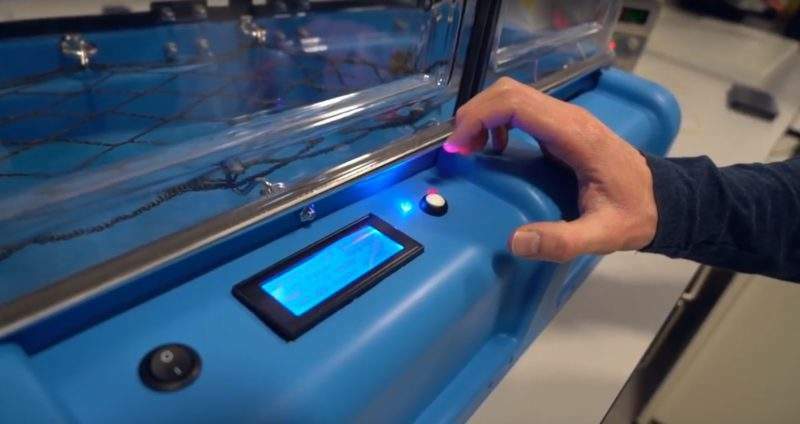 This is a problem biomedical engineers at the University of Strathclyde, Glasgow, funded by the Defence Science and Technology Laboratory through the Defence and Security Accelerator, are seeking to rectify. 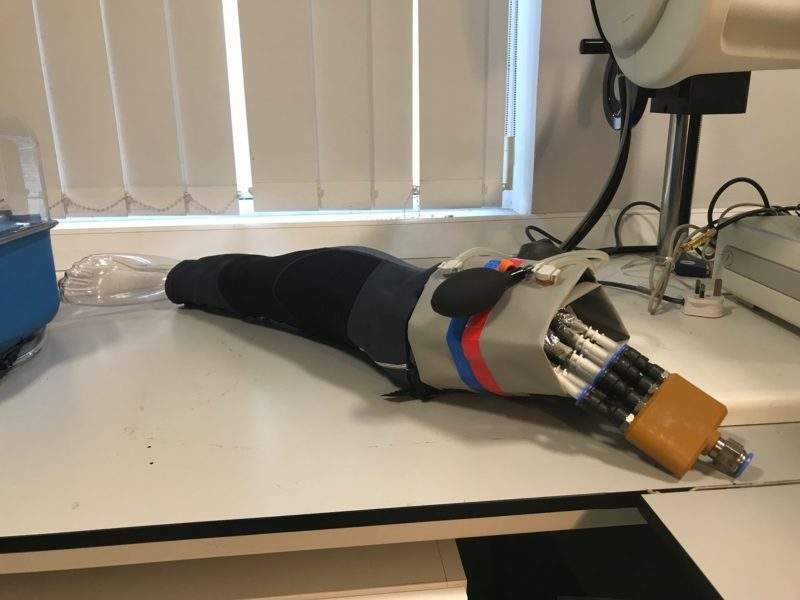 The team, led by head of Strathclyde University’s Biomedical Engineering department Professor Terry Gourlay, is pioneering a suite of bioengineering technologies to help address a number of dire battlefield realities. Gourlay describes the university’s limb treatment technology in further detail. Elliot Gardner: Where did this technology come from, and why is it needed? Terry Gourlay: We’re all aware of the number of young folks coming back from conflict suffering from limb injuries, often followed by limb loss. This is quite often due to the nature of the injury and prolonged application of tourniquets. We wanted to take a look at the area, particularly the route casualties on the battlefield take from the point of first contact through to the hospital setting, to see if there’s anything we can do with technology to enhance the possibility for recovery for those limbs post-treatment. Of course it’s a very austere environment, so whatever technologies that we bring to bear have to be suitable for deployment in a very sparse setting, where you don’t have access to mains power, water, or other supplies that you might see in a general hospital setting. It was critical that we added technology to the point of first contact so that our intervention would take place as early as possible prior to evac. EG: Tell me more about how the technology works. TG: There are three main steps when treating an injury such as this. First you stop major haemorrhage, which usually occurs alongside these injuries, then you try to preserve the tissue during the transit period, then you need to support the tissue at the hospital setting. So first we created a new form of pneumatic alternating tourniquet, made up of two adjustable bladders – which applies pressure alternately to two points on the limb, as if you only apply pressure continuously to one point, that itself can cause major injury. We then developed a system whereby the limb could be put into a cooling sock, cooled with bottled gas. This will drop the limb temperature down, reducing its metabolic requirements, and enhancing the potential for the recovery of the tissue once you warm it back up again and reperfuse it. We proposed that we would treat the limb by isolating it from the body – keeping the tourniquet on, in other words – and would perfuse it using ECMO [extracorporeal membrane oxygenation] surgery, which is traditionally used on small children but here basically acts as life support system for the limb. It has an artificial lung, and a pump which performs the function of an artificial heart. You would then perfuse that limb over a period of time, preserving the tissue, giving it nutrients, allowing surgeons to consider a repair to the limb, rather than simply amputating it. EG: Were you surprised at the dearth of technologies in this area? TG: I was! Battlefield injuries, particularly injuries to the extremities, are treated very much like they were during the Battle of Waterloo – you simply tie a string around it and stop the haemorrhage. I believe the current thinking is ‘spare the life and lose the limb if you need to’. That’s laudable, but we just felt that there was more that could be done with modern technology. The key was developing technology that was deployable. We realised that medics will have to carry this into the field. And it had to be simple so the technology can be used by your normal medics. That was certainly an engineering challenge, which, at the University of Strathclyde, we thrive on. EG: How severe of an injury can be treated with this technology? TG: Our objective was to develop technology for which we could preserve an injured limb – attached or otherwise. There’s no reason why you couldn’t have an amputated or removed limb that looks as if there may be some viability to save it, and preserve it using this technology. Obviously, there are some major ballistic injuries that are simply beyond repair, but we’re presenting the best possible conditions for rehabilitation. EG: Was the focus always battlefield applications? TG: Our funding came through the Ministry of Defence. So clearly the primary application would be for military deployment. But the Ministry of Defence also respects that there may be a significant civil need for the technologies. Not only in areas of terrorist injury to civilians, but also with natural disasters, or any environment where there may be trauma to the extremities. But what really struck me was the number of military personnel returning from service with amputated limbs in the modern world. The reason is really the advances in body armour. Where these folks are receiving injuries to the limbs, perhaps blast injuries, conventionally they may also have received injuries to their torso and their head, which may have been fatal. But with improvements to body armour, most of those injuries are confined to the extremities, which are not protected in the same way as soldiers need to remain articulated. EG: Can the technology be used alongside other medical services? TG: This system also lends itself potentially to the application of new tissue engineering processes. If you’re supporting the limb over a long period of time, it may be possible to use systems such as stem cell-derived tissue regenerations to help regenerate the tissue in those injured regions. Without such a support system it would be very difficult to do that. We have also worked separately on a blood salvaging system, which was developed as a military spin-off of a very successful clinical technology that I developed a few years ago. The concept is what’s known as auto-transfusion, where you remove blood from a wound as the wound haemorrhages using suction, then you filter it and process it, and return it to the patient, returning the patient’s own blood back to them as they’re haemorrhaging on the battlefield. I think there’s an application where we’ll see these two technologies being used in unison. EG: What was the biggest challenge you faced in development? TG: I think the biggest challenge was in developing an effective cooling system that was effective and predictable, and field-deployable. For the other technologies, the tourniquet and the tissue support system, it’s just a case of making everything as automated as possible, as there may not be many highly trained technicians in the field. 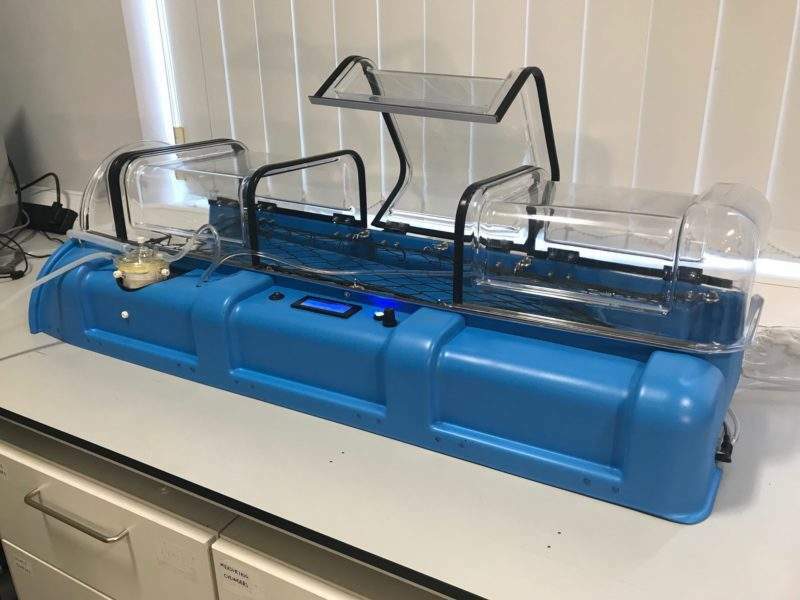 The technology also only weighs 5kg total, which was challenging – if you look at a cooling system that you might use in a clinical hospital, it’d be a big watered cooler, connected to a heat exchanger, and would weigh 40kg-60kg. But our system is designed to be deliverable at the first point of contact.